Cheep out of Water is a fangame by Friendly Dictator. It was his entry for Minigame Competition #7, in which it came in second to Puddin's Bloop Rinse. 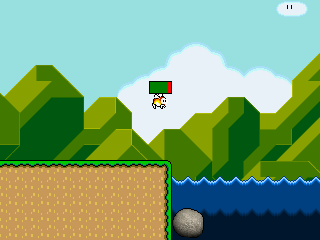 In the game, you must guide a Cheep-cheep to water before it suffocates. It currently has an average review score of 5.8 on the main site. This page was last edited on 24 July 2016, at 23:46.